WEL COME TO THE ENCHANTING WORLD OF BUTTERFLIES! You’ve received your kit and now you’re wondering, what in the world you should do! You should have received a special card with instructions on it. This page has additional life cycle kit tips to help give you an even more positive experience! Also, if you live in New Mexico, you know we have a unique environment because we are so dry. We’ll address those issues below as well. Your kit comes with everything your caterpillars need to grow. They will molt (shed their skin) four times before being ready to pupate (make their chrysalis). DO NOT open your cup for any reason until after all the caterpillars have gone to the top and made their chrysalids. This is a phase of observation, not interaction. 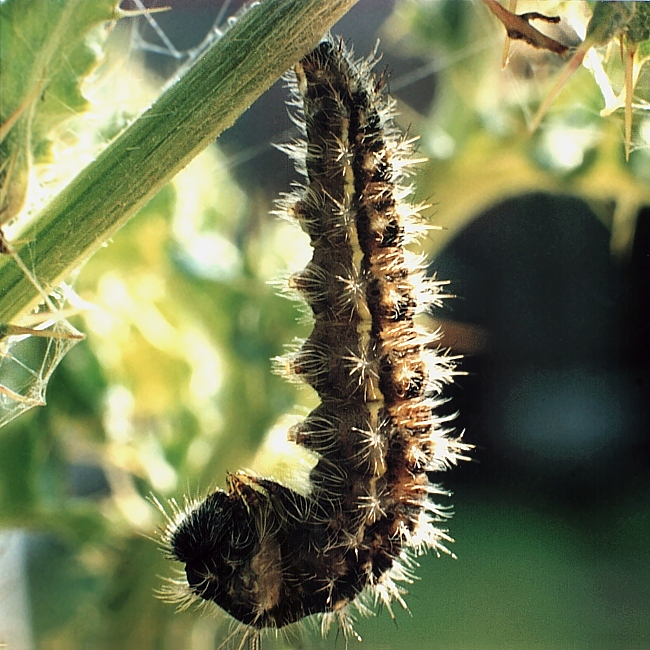 Especially in the arid Southwest, your caterpillars need the moisture this cup provides to them and their food. If you are opening the lid, it lets more dry air in, which could dry out their food, making it impossible for them to eat. If you look closely, you will see that your lid has two tiny holes in the top. Those holes provide more than enough air for your caterpillars. Your caterpillars are also very susceptible to disease and opening/closing the lid allows potential pathogens to enter the cup to infect them. Watch as your caterpillars spin webbing around the cup. Do you know why they do this? In the wild, these caterpillars will use their webbing to close leaves around themselves to protect them from predators. They also use the webbing to secure themselves as they move around. Your caterpillars will grow at an astounding rate. You will be surprised at how large they get from when you brought them home. When your caterpillars have crawled to the top and spun a “button” of web to hang from, watch closely as they are getting ready to make a chrysalis (or pupa), the final stage before becoming a butterfly. They will hang in the shape of a “J” for 12-24 hours before shedding their skin for the last time. Once all your caterpillars have made their chrysalids, wait 24 hours and then remove the attachment pad (that they have all formed on) and pin it inside a net cage. You can use a straight pin to pin the attachment pad into your net cage, or you can lay it on the bottom of your cage. The butterflies will emerge from their pupae and crawl up to the sides of the cage to expand their wings. If you’ve had a chrysalis or two fall to the bottom of the cup, no problem! Carefully pick them up and lay them in the bottom of your net cage. You may want to place a paper towel on the bottom of the cage before placing the chrysalids there. You will notice that the chrysalis is actually a pretty hard case once it’s formed and hardened. You will not harm it by gently touching it. You should mist your chrysalids lightly each day as they tend to dry out in our arid climate, but don’t over-soak them. They should be misted a minimum of 2 times per day. Butterflies need moisture to successfully emerge from their chrysalis case. If they are too dry, you will see crumpled wings or even butterflies that are unable to emerge from their chrysalis. If you are unable to mist them adequately, you can take a clear trash bag and place it over 3/4 of your net cage. Then take a wet paper towel and place it between the trash bag and the top of your net cage (image to left). This paper towel will need to be refreshed each morning. This will help maintain a much higher humidity level inside the cage than misting will do. If you do this, you do not need to mist at all. After approximately 7-10 days, your butterflies will begin to emerge from their chrysalids. Your butterflies are extremely vulnerable at this stage. Their wings start out crumpled and wet and they have to pump the fluid from their abdomen into their wings. You do not want to handle the net cage at this time because if the butterfly falls, its wings could be permanently damaged. It’s a great time to observe again as the wings grow and the abdomen shrinks. It all happens pretty fast! Wait for the last butterfly to emerge and give them about 6-12 hours to dry their wings. Then release your butterflies outside! If the temperature is below 65 degrees, they will not fly very well. Wait for a warm, sunny day to release them. Butterflies are like little solar machines. They NEED the sun to warm the muscles in their wings to enable them to fly. If you need to keep them for a few days, you can feed them sliced oranges/watermelon or sugar water in a bottle cap at the bottom of their cage. You can watch as they uncurl their proboscis (the straw they use for drinking nectar) to eat. Do not place your cup in a window or in direct sunlight. Do not use insect spray in the same room as your cup. Do not leave your cup in a hot vehicle. Wings of Enchantment adheres to strict guidelines for the rearing, care, & shipment of live butterflies for release.